Description: This tree is 35-80' tall at maturity, forming an open irregular crown that is more or less ovoid or obovoid in shape, and a short to medium-length trunk that is 1-3' across. The trunk usually divides into several large ascending branches that eventually subdivide into smaller branches and very abundant slender twigs. 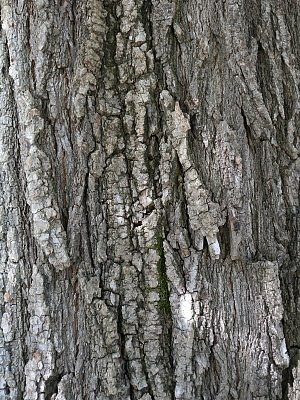 Trunk bark of mature trees is light gray to gray, rough-textured, and irregularly furrowed with fragmented ridges. Branch bark is gray and more smooth, while twigs are light brown to reddish brown and glabrous. Young leafy shoots are light green and often short-pubescent. 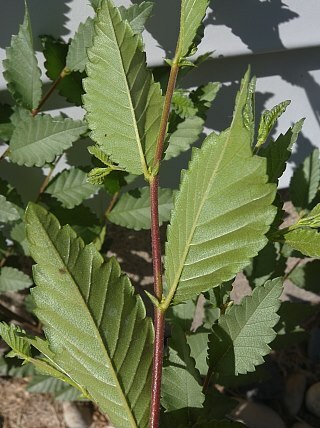 Alternate leaves occur along the twigs and shoots; they are ¾-2½" long and 1/3-1" (8-24 mm.) across. Individual leaves are elliptic to oblong-lanceolate in shape and serrated along their margins. The upper leaf surface is medium to dark green and glabrous, while the lower surface is pale green and either glabrous or short-pubescent along the major veins. The petioles are light green, ¼" in length or less, and either glabrous or short-pubescent. Small clusters of 3-15 perfect flowers are produced at intervals along branches of the preceding year. Individual flowers are about 1/8" (3 mm.) across, consisting of a green calyx with 4-5 lobes, 4-8 exerted stamens, and a flattened pistil with a divided style. There are no petals. The slender pedicels are about 1/8" (3 mm.) in length. The blooming period occurs from early to mid-spring before the leaves develop, lasting about 1 week. The flowers are cross-pollinated by the wind; they are also self-fertile. The flowers are replaced by glabrous samaras that are light green, oval-orbicular to orbicular in shape, and flattened; they become about ½" long and light tan at maturity. Each samara has a single seed at its center, which is surrounded by a broad membranous wing. The samaras are distributed by the wind during late spring or very early summer. Under damp conditions, the seeds have the capacity to germinate within a week or two. The woody root system is branching and widely spreading. The deciduous leaves turn yellow for a short period during the autumn before falling to the ground. Cultivation: This tree adapts to full sun, moist to dry conditions, and practically any kind of soil, except highly acidic. Because of reduced competition from other trees, it tends to thrive in barren soil containing too much sand, gravel, or clay. Growth and development of young trees is rapid, and their longevity can extend to 50-100 years. Siberian Elm is resistant to Dutch Elm disease, which is often fatal to other elms. It is prone to storm damage from wind, snow, and ice (especially the latter), causing breakage of branches and twigs that can litter the ground underneath the tree. The frequent result of such damage is a tree with an ungainly and ragged appearance. Another problem is the tendency of its roots, like Willow trees (Salix spp. ), to seek out water, clogging underground water and sewer lines. In relatively open areas, this tree can reseed itself aggressively and become a nuisance in areas that are beyond the reach of a lawnmower. On the positive side, its open crown allows enough light to pass through and maintain turfgrass underneath. Range & Habitat: The non-native Siberian Elm has naturalized in many areas of Illinois (see Distribution Map). Its abundance is highly variable across different localities within the state, although it tends to naturalize more often in urban and suburban areas. This tree was introduced into the United States from east-central Asia. During the 1950s, it was widely planted as a replacement for the native American Elm (Ulmus americana) in lawns and along streets. This was in response to the sharp decline in populations of American Elm after the introduction and spread of Dutch Elm Disease in the United States. 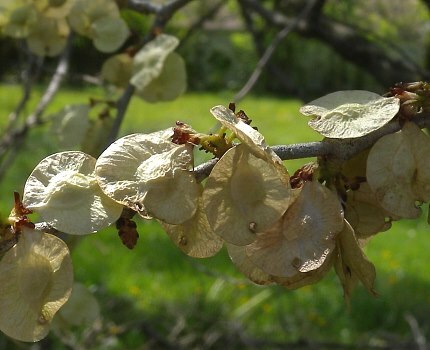 In Illinois, habitats of Siberian Elm include open disturbed woodlands, thickets and weedy meadows, areas along buildings, roadsides and areas along railroads, vacant lots, and fence rows. Because of Siberian Elm's intolerance of shade, relatively open habitats with a history of disturbance are preferred. Faunal Associations: The caterpillars of some butterflies feed on the leaves of elms (Ulmus spp. 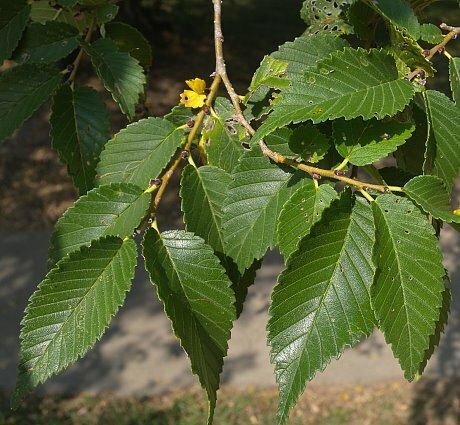 ), but it is unclear to what extent Siberian Elm functions as their host plant. There are also many caterpillars of moths that feed on these trees (see Moth Table); because some of these species are highly polyphagous, it seems likely that at least some of them also feed on Siberian Elm. Other insects that feed on elms include the Siberian Elm Aphid (Tinocallis saltans) and other aphids, Gossyparia spuria (European Elm Scale) and other scale insects, the leafhoppers Eratoneura basilaris and Eratoneura bigemina, the Common Dog Day Cicada (Tibicen linnei), the Elm Lace Bug (Corythucha ulmi), the plant bug Lopidea heidemanni, larvae of the Elm Borer (Saperda tridentata) and other wood-boring beetles (see Wood-Boring Beetle Table), larvae of the Small European Elm Bark Beetle (Scolytus multistriatus), both larvae and adults of the Elm Leaf Beetle (Pyrrhalta luteola) and other leaf beetles, and larvae of the Elm Sawfly (Cimbex americana); see the Insect Table for a more complete listing of these species. Of these, the Siberian Elm Aphid and Elm Leaf Beetle are known to prefer Siberian Elm as a host plant. Among vertebrate animals, either the seeds or buds of elms are eaten by several species of birds, including the Greater Prairie Chicken, Wild Turkey, Ring-Necked Pheasant, Carolina Chickadee, Purple Finch, Rose-Breasted Grosbeak, and House Sparrow. The Gray Squirrel, Fox Squirrel, Red Squirrel, and Eastern Chipmunk also eat the seeds or buds of these trees to some extent. Because Siberian Elm frequently has branches that break off the tree during stormy weather, this promotes the development of cavities that are used as nesting habitat by such birds as the House Sparrow, Starling, Downy Woodpecker, and Carolina Chickadee. Tree squirrels also use such cavities as dens. Photographic Location: Residential areas near the webmaster's apartment complex in Urbana, Illinois. Comments: This tree probably has more potential to be invasive in the Great Plains and western states, than Illinois, where the fertile soil and abundant moisture of the latter enables oaks, maples, and other tall canopy trees to flourish. Under these circumstances, Siberian Elm is unable to compete with the taller and more shade tolerant tree species, except as a pioneer tree in disturbed areas. Siberian Elm is easily distinguished from other native elms (Ulmus spp.) by its small leaves (often only 1" in length). Sometimes, it is referred to as 'Chinese Elm,' but this corresponds to another species, Ulmus parvifolia, that differs by having flaky trunk bark, rather than furrowed bark, and flowers that bloom during late summer or autumn.